Alert Protective Services is Chicago’s premier, award-winning and locally operated source for your home security needs. Since 1982, APS has been a leader in home and business security systems in the Chicago land area. For the last 28 years, this family-owned company has been standing behind their exceptional products and services. Reliability is one of APS’s highest priorities. The owners, operators, and technicians of this Chicago-based company know exactly how to minimize the safety concerns and problems local residents and businesses face on a daily basis. Another benefit to working with Alert Protective Services is that there is no out-of-town management. This ensures the most rapid and prompt service possible. APS is always there when you need them. They provide a higher level of service to secure your family’s safety, as well as the safety of the community. APS strives for customer satisfaction and loyalty. They treat every customer with the same high level of service and protection that they use to protect their own families. Residents of Westchester 60154 can be at ease knowing that they receive the best service and support, when it comes to home security systems from the professional at APS. Also, APS provides excellent 24 hour a day support on all their products and services. Their goal is to ensure the safety of your family and loved ones. Westchester is western suburb of Chicago, located in Cook County. It has a population of 16,824 residents. There are 7,015 different households and 4,924 families in the village. Westchester’s has a diverse Italian, German, Irish, Polish, and Czech ancestry. The median household income in Westchester is just under $60,000. Westchester is a calm, laid back community that has a rich history, but there are some problems that do affect the area. 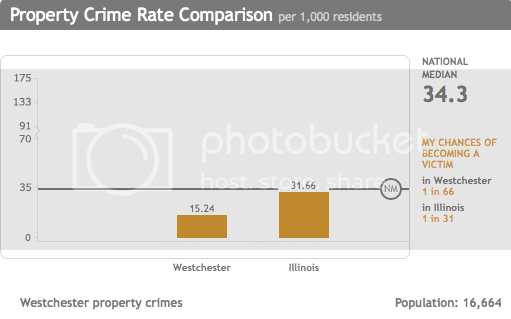 In recent years, burglary has been on the rise in Westchester. There was an average of 86 crime committed per square mile last year. This is high with regards to the national average of 49.6, but slightly lower than the Illinois average of 104. To get a better understanding of where the crime is coming from, we look to last year’s statistics. There were a total of 276 crimes committed in Westchester, although this is a relatively low number, it has steadily been on the rise. Out of the 276 crimes, 254 were property crimes and only 22 were violent ones. Burglary and theft has become more and more common. For example, the odds of being in a violent crime are 1 in 769 in Westchester, whereas the odds of being in a property crime are 1 in 66. Homeowners should be aware of these statistics and take the necessary steps in order to reduce them. The best way is to have a home security system in place in your home and/or business. A recent study done by the FBI found that homes with security systems are 15 times less likely to be burglarized. Also, most homeowner insurance policies offer considerable discounts to homes with security systems in place.